How many calories you need per day to lose weight? A well-balanced diet consists of nutritious carbs, lean proteins and healthy fats. Based on individual calorie intake, we can accurately calculate how many grams of each trace element you need to consume per day. 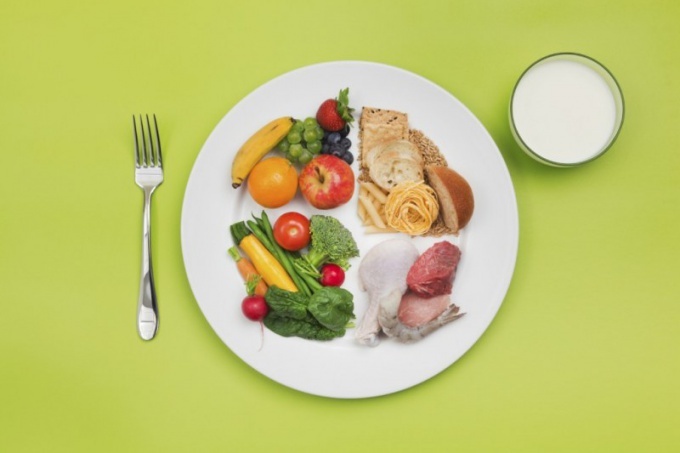 Proper nutrition should be balanced in energy and nutrient content. These substances include not only proteins, fats, carbohydrates, but also minerals, vitamins, water and dietary fiber. Protein is essential for growth and repair of muscles and other tissues of the body. Fats – one source of energy, they are also necessary for the absorption of vital fat-soluble vitamins. Carbohydrates – the main source of energy. Minerals and vitamins play an important role in many processes occurring in the body, water is the medium for carrying nutrients, fiber is also essential for digestive system health. Every activity has its energy consumption, it is usually possible to determine various placed in the reference books and the Internet tables. The body's energy needs based on basal metabolic rate and additional needs. Every kilogram of body weight every hour requires approximately 1,334 calories. A man weighing 60 kilograms should be consumed daily calorie 1921 ( 1,334х24х60). Depending on lifestyle, intensity sports, are calculated additional the body's need for energy. Thus, the athletes spend no less than 8.5 calories for each pound of body weight per hour of exercise. Therefore, the diet of a person weighing 60 kilograms, a daily sports needs to be more even on 1200 calories ( 8,5х2х60). At a moderate diet balance of carbohydrates, fats and proteins looks like 50%, 25% and 25%, where the first carbohydrate, then protein and fat. The zone diet consists of 40% carbohydrates, 30% protein and the same amounts of fat, low-fat diet of 60% carbohydrates, 25% protein and 15% fat, low-carb or ketogenic diet consists of 10% carbohydrates and equal amounts of protein and fat. Athletes build muscle, should choose a diet in which protein intake exceeds 15%. In the days of intense mental strain the person needs more than 40% carbohydrates. In order to find out exactly how much protein, fats and carbohydrates in the day you should eat, again it will have to do the math. Thus, when a zone diet in the diet at 2000 calories, you'll need 40% of calories from protein – 2000х0,4 = 800 calories, the same number of calories from fat and two times less, that is, 400 calories from carbs. Now, note that 1 gram of protein 4 calories, about the same number of calories in 1 gram of carbohydrate and 9 calories in every gram of fat. Therefore, you need 800 calories from protein is 200 grams of protein a day, the same number of calories from fat - it is about 89 grams of good fats a day, and 400 calories from carbs is 100 grams of this macronutrient that you need in these energy costs and in this diet.